I am one of those fortunate people who has known what he’s wanted to do all his life. In a journal I kept at age 10, I noted that I wanted to be a writer when I grew up. (My second choice was “mad scientist.”) I wrote for both my high school and college newspapers, and when I graduated college, in 1990, I took a job with Skiing Magazine. In the line of reportorial duty, I skied all over the world, including in Iran, China, Bolivia, and on the glaciers of Mount Kilimanjaro. I also wrote about odd sports for Sports Illustrated and traveled widely for National Geographic Adventure — crossing the Sahara desert with migrant workers; documenting the impact of animal poachers in the Central African Republic; attempting, with my sister, to climb Cho Oyu, the sixth highest mountain in the world. While traveling in Haiti, I witnessed the desperate measures people took to escape the difficult economic circumstances there. Some built tiny boats of scrap wood and recycled nails, and attempted to sail across hundreds of miles of open water to try and start a new life in America. I was given an assignment by The New York Times Magazine to document one of these voyages, and along with photographer Chris Anderson and 44 Haitian migrants, we sailed off. The trip nearly ended in disaster — we were rescued at sea by the U.S. Coast Guard, luckily, just as we were about to run aground on a coral reef. Then, working for The New York Times Magazine, I covered conflicts in Israel and Afghanistan, investigated the international black market for human organs, looked into a strange murder in Kentucky, and spent time getting to know a former Taliban soldier. During a New York Times assignment about allegations of child slavery on the cocoa plantations of west Africa — cocoa is the chief ingredient in chocolate — I found that the young workers on the plantations were extremely shy, and when writing the article, I combined several boys’ quotes together to create a composite character. Such fictionalization is against the rules of journalism, and when the story was published an aid agency questioned my reporting, and after I confessed my actions to my editors at the Times, I was fired. Then came a twist so bizarre and unexpected that it practically defies belief, yet is completely true. On the same day that my firing from The New York Times was made public, I learned that a man named Christian Longo, who was on the FBI’s Ten Most Wanted Fugitives list, accused of the horrific murders of his wife and three young children, had just been arrested in Mexico. While on the run, Longo had briefly taken on a new identity, which was not a surprising action for a most wanted fugitive. Except that the identity he took on was mine. 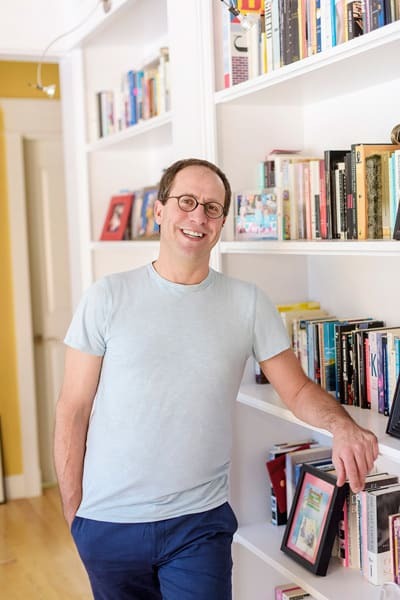 He told many of the people he met that his name was Michael Finkel, and that he was a writer for The New York Times. I wrote a letter to Longo, who was being held in jail in Oregon, where the murders took place, and this initiated a bizarre and disturbing two-year correspondence, during which we exchanged more than 1,000 pages of handwritten letters while Longo tried to convince me of his innocence. I became obsessed with discovering the truth of the crimes, and this obsession resulted in a book, True Story. The book was later optioned by Brad Pitt’s production company, Plan B, and adapted into a 2015 motion picture, also called True Story, starring James Franco, Jonah Hill, and Felicity Jones. Later, I began working for National Geographic Magazine, spending time with field scientists on a volcano in the Democratic Republic of the Congo, and in caves filled with ancient artifacts in Nepal, and in the malaria-ravaged regions of Zambia. Other National Geographic assignments took me to one of the last remaining hunter-gatherer tribes in Tanzania; to an astonishingly rugged group of people living high in the mountains of Afghanistan; and to seek mushrooms in Tibet that can be worth more than gold. I never specialized in one topic in my writing career — I just wrote stories that grabbed my interest, no matter the subject. I interviewed a man who spent 40 years running from the law. I spoke at length with three young boys who were horrifically lost at sea. I wrote about an eccentric genius who believes that a few medical breakthroughs will allow humans to defeat death. And I watched, amazed, as man named Daniel Kish, who is completely blind, demonstrated to me that he’d taught himself how to navigate the world using echolocation, like a bat. I married a brilliant biostatistician and we had three children, in quick succession, and suddenly my home in Montana was filled, day and night, with noise. I found myself desperate to find some peace and quiet, and even travelled to India to attempt to meditate silently for 10 days, a mission that did not go well. Then one morning in 2013 I read about a man who had fled the world at age 20, lived alone in a tent in central Maine, and apparently spent 10,000 consecutive days completely silent. Instantly curious, I wrote a letter to this man, named Christopher Knight, and he proceeded to share with me the most incredible and moving and confounding story I’d ever heard. Knight’s tale is the basis of my new book, The Stranger in the Woods.